Gain a deeper understanding of our world! Our programs provide you with a holistic and multi-faceted understanding of our world, and the issues our environment, people and planet face today. You’ll come out of our programs with the knowledge and hands-on skills that will make you highly employable. We ensure you have the most useful learning experience through classes that provided computer-based geographical analysis skills and fieldwork experience in addition to conventional lectures. 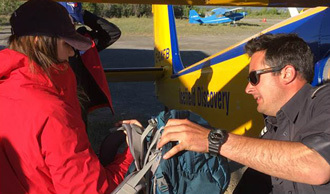 Learn to use technologies such as cartography and geomatics to solve geographical questions, and gain unforgettable field experience in Canada’s north and around the globe. We also provide several options to enhance your learning experience. The Environmental Studies programs were traditionally bilingual with mandatory language requirements, but now you have the choice to study in English, or in French, or both! You can also choose to participate in the CO-OP program, where you get four paid internships. You can come out of your degree with real work experience, making you much more employable and giving you a big head start on your career. 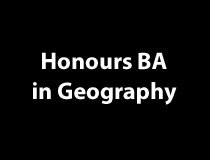 With an Honours BA in Geography, you will develop your critical thinking about the interaction of our physical and human environments. You will be provided with multi-faceted perspectives on the spatial dimensions of the physical and human worlds, all while learning about the environmental and social issues that are affecting Canada and the World in the 21st century. You will be learning about climatic and environmental changes, including their social, economic and political impacts. You will have the opportunity to use technologies such as computer-based mapping and data analysis as an integral part of the curriculum, and the chance to take part in exciting field courses in Canada`s north and major cities. 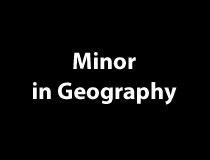 With a Minor in Geography, you will be provided a comprehensive overview of the processes and interactions of both human and physical environments. By gaining the skills and abilities to analyze our world from a spatial and holistic perspective only geography provides, you will enhance your main discipline making for a truly unique learning experience. 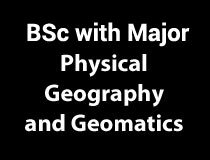 NEW at our Department, the BSc Major in Physical Geography and Geomatics (Co-Op option) is an interdisciplinary program that combines compulsory courses from physical geography, geomatics, computer and natural sciences. 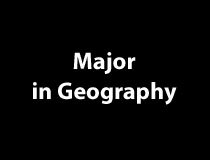 You will focus on core components of this program such as Geographic Information Systems and Remote Sensing which will provide you with skills that are in high demand in the work force and are essential for present day geography and other disciplines. Field work is a critical component of physical geography, thus you will be taking two mandatory field courses and will have several optional ones in Canada`s north or abroad. You will be focusing on areas such as northern environments, climate change and spatial analysis. Unilingual option for Environmental Studies programs now offered. 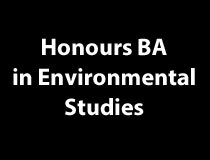 The Honours BA in Environmental Studies is an interdisciplinary program that focuses on environmental issues faced by our world, which affect our health, economy, and global ecosystem. Our program gives a foundational knowledge of biophysical scientific processes, and an in-depth understanding of the social, economic and political implications related to environmental processes and change. Understand the science-policy interface, and learn to situate the natural and social sciences in the broader frameworks of culture, humanism, environmental ethics, economic development, and politics. Students graduate with an advanced ability to critically analyze environmental problems and solutions at local, national and international scales. Please note that a bilingual option is also available for this program! Unilingual option for Environmental Studies programs now offered!. 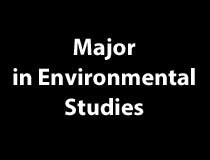 The focus of the Major in Environmental Studies is on the identification of issues and solutions to major environmental problems, which are often social and political in nature. Gain a solid foundation in both natural and social sciences, as well as a song sense of the challenges and strategies involved in managing environmental problems at various scales. This program option allows you to take a second major, or add a minor program. Synthesize your knowledge of environmental issues with another discipline, or take this highly relevant field and apply it to another area of interest. Please note that a bilingual option is also available for this program! Unilingual option for Environmental Studies programs now offered. Add a Minor in Environmental Studies to your main discipline to gain a deeper understanding of environmental challenges and solutions. Develop a holistic awareness of environmental issues, from an introduction to the scientific processes to a more profound base of the broader social and political implications. As a multifaceted field, environmental studies is applicable to many disciplines and will enhance your primary field of study. Please note that a bilingual option is also available for this program! 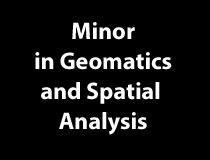 The Minor in Geomatics and Spatial Analysis allows students to develop exceptional spatial analysis and mapping skills through the use of hands-on computer technologies. Human and physical geography courses are taken to develop the ability to think critically about spatial phenomena, while core computer science courses are given to enhance the skills needed to manage and analyze spatial data. Students acquire advanced abilities to utilize computer-based mapping technologies, including Geomatics, Geographical Information Systems (GIS) and Remote Sensing, in order to solve pressing spatial issues, both environmental and human in nature. This option can be integrated into most of the BA and BSc programs of the Faculty of Arts.The 12 course-unit option in Geomatics allows students to develop competencies in geomatics applications in view of applying them to a wide variety of fields and disciplines. The field of geomatics uses science and information technologies to gather and manage spatial data. It draws on a variety of disciplines such as geography, computer science, mathematics, as well as GIS, GPS, and remote sensing. The applications of geomatics include health-care planning, epidemiology, criminology, environmental monitoring and urban planning. It is ubiquitous in today’s society; there are numerous examples of this including the creation of the Centre for Geography and Exploration in Ottawa, the evolution of Google Maps, the navigation of autonomous vehicles, and the growing use of satellite remote sensing of the environment. The name of the option will appear on your transcript. Adding one or several options to your degree allows you to be the architect of your degree and develop additional competencies beyond your fields of study.